You might wonder what is the purpose to export wireless network profile, actually there are needs sometimes to export/import the network profile. You can export the network profile when you need to reinstall the Vista and import it again after the installation. Also you can export the network profile to other computers and save your time to configure wireless network setting. 1) Go to Start -> All Programs -> Accessories -> then click on Command Prompt (cmd.exe). 2) Command prompt window will open, then type netsh wlan show profiles and hit Enter button to show available wireless network profiles on this computer. In the following example, I have home-network and office-network wireless profiles. 3) Ok! Let say I want to export home-network profile to a thumb drive (G:\wireless-profile), I issue the command netsh wlan export profile name="home-network" folder="g:\wireless-profile"
Note: This command usage: netsh wlan export profile name="profile-name" folder="the-folder-you-want-to-export-to"
Note: Here is another example by exporting the home-network profile to desktop’s wireless-profile folder: netsh wlan export profile name="home-network" folder="c:\users\Ivan\desktop\wireless-profile"
Here I will show you how to import wireless network profile (home-network) on other computer from thumb drive (G:\wireless-profile). 1) Open the command prompt again, type netstat wlan show profile, and you will see no profile here. Then you type netsh wlan add profile filename="g:\wireless-profile\Wireless Network Connection-home-network.xml", you will then add the profile successfully on this computer. By default it will add to all user profiles, so everybody on this computer can see this new profile and use it. 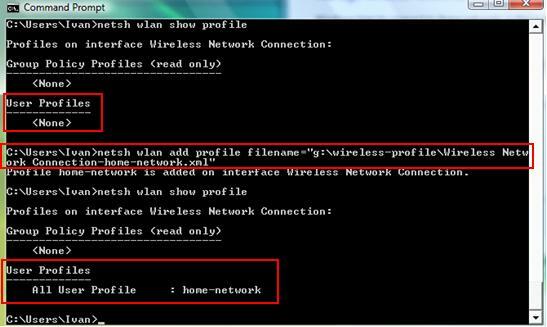 Return to top of "Simple Method to Export Wireless Network Profile – Windows Vista"! !